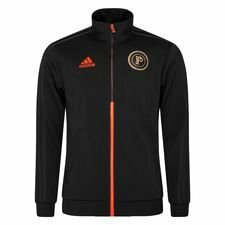 adidas is ready for a new limited edition season of the Paul Pogba Capsule Collection, as they move into the 5th season, where adidas merges Paul Pogba’s first and forever love, football, with his passion for basketball. adidas has done it again with their latest limited edition adidas football boots, the Paul Pogba Season 5 Predator boots. High-end fashion meets football once again, as Paul Pogba gets his latest Predator 19+ boots, which displays his creative dynamics and natural flair on the pitch. 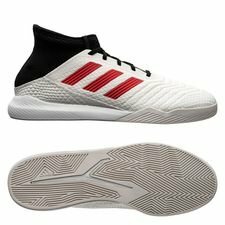 adidas has merged Pogba’s love for football with his passion for basket, which gives us a cool whiteish boot with a cool snakeskin pattern, offering one of the Control Masters of the game an extravagant look on the pitch. 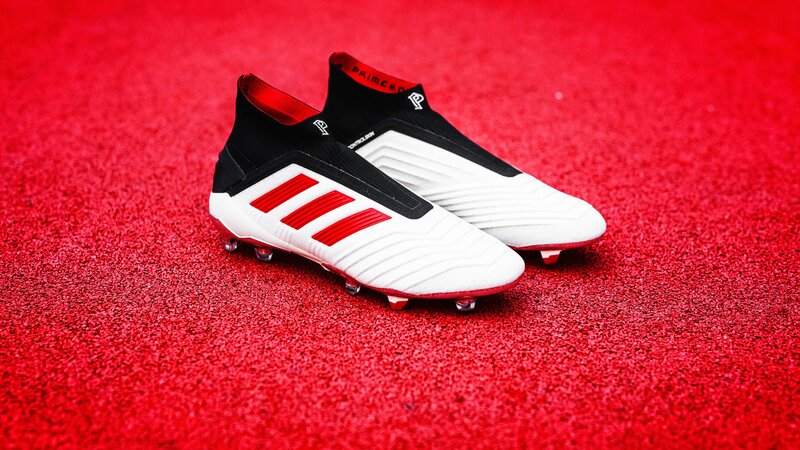 To keep a clear connection towards the Predator heritage, adidas has taken the essence of the Predator, the colours white, black and red, and placed it on the new limited edition boots. 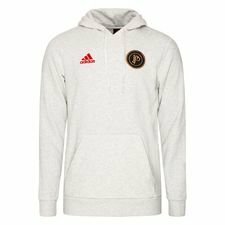 But they have done it in a reversed way, as the boots comes with a white base, rather than black, and with black and red details. 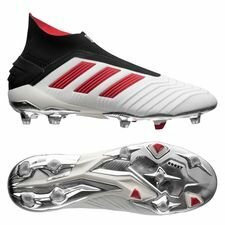 Furthermore, the soleplate on the boots completes the Pogba look, as it contains silver details and cool red studs. Everything on these new Predator 19+ boots screams Pogba and we can’t wait to see him in action, while wearing the Season 5 boots. 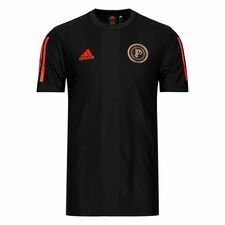 But the new Paul Pogba Season 5 collection doesn’t only contain a new boot, but a full range of styles, that takes your off the pitch look to a new level. 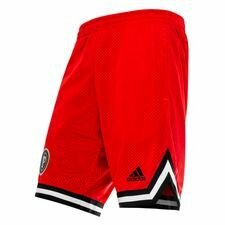 adidas has designed a cool basketball jersey and shorts, where the shorts are reversable, so you can use them both for football and basket, depending on what sport you’re going to rock on the day. 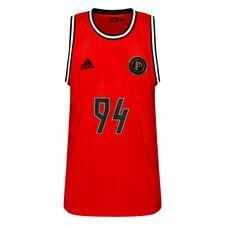 The basketball styles feature a new and cool PP badge, which is specially made for this collection, which surely is going to display Pogba’s passion for basket. What would a football x basketball collection be without a trainer, that’s inspired by one of the hottest names in basket right now: James Harden. 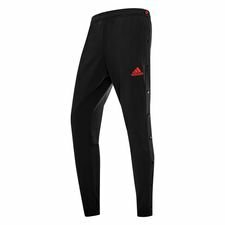 adidas has used the Harden Vol2 tooling, which gives the trainer a better shock absorption, which also is visible on the trainers. 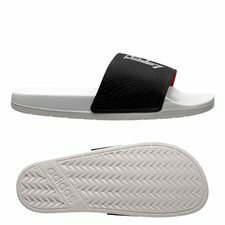 The trainers are not a regular Predator trainer, as it features a larger BOOST midsole and a more protective heel cap than regular trainers, which makes it perfect for your basketball look on the street. We can’t wait to see Pogba display his skills in the new Season 5 collection Predator boots, during the next couple of weeks. You don’t have to wait too long to get your pair, as the boots are already available at Unisport NOW. 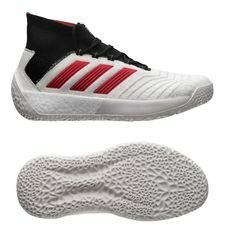 Get your Paul Pogba Season 5 boots here.